Killer Deal!!! - Limited Qty!!! - May not Include Wall Mount Bracket - Satisfaction Guaranteed!!! Intensify your entertainment experiences by adding high-quality Nakamichi home speakers to a TV, video and home audio system. With the right configuration, you can enjoy a favorite song or movie the way it was intended to be heard. Japan-based Nakamichi Corp. was established in 1948 as an audio and optic research and development company. Since 1973 when it moved in manufacturing, Nakamichi has had a reputation for innovative, high-quality audio products. 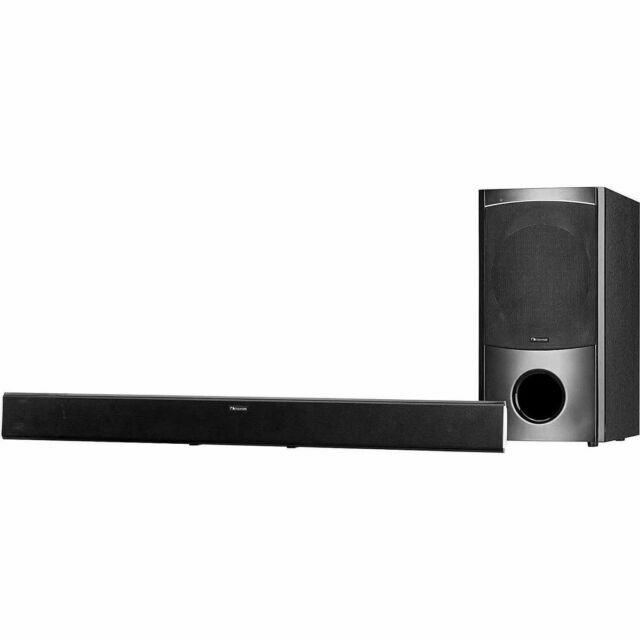 Add the richness of surround sound with the Nakamichi NK6 model sound bar and subwoofer. It offers a 3D feature and four different sound modes. These slim sound bar / subwoofer speakers improve the audio quality of a TV and provides ample bass, while fitting neatly into even the most minimal living space. A 2.1 channel system is a stereo system with two channels of sound, left and right, delivered by a pair of satellite speakers powered by a subwoofer. The result is excellent audio for TV, movies and music without the clutter of additional wires and speakers. Coaxial audio input cables, like those on these speakers, are the most common digital audio connection because of the ability to handle a wide frequency bandwidth. Easy to install. For the price, sound quality is good (would liked to have better). Good assortment or sound types via remote. I do recommend but know you are not getting the best, but you are getting good value. I like the system. For the price it can't be beat. The sub sounds nice and clean. Very deep and clear. The system features are great. I am just not a big fan the bar itself. I think it does not provide a rich enough sound for my taste. But definitely this system is great for the money and an upgrade to TV audio. Not for home theater! Drives me CRAZY!! Sound Bar generally works well. Pros: Good sound, slick design, easy to install, Bluetooth ready. Cons: corded between woofers and speakers, poor equalizer on remote.